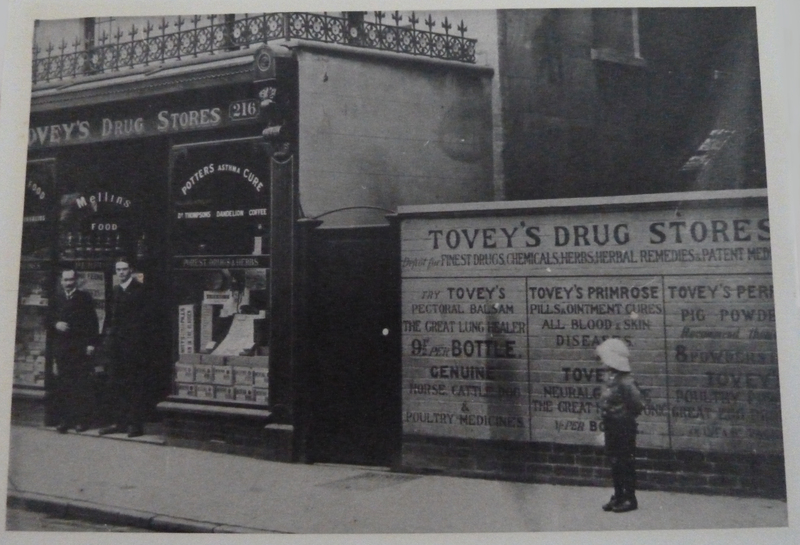 The Tovey brothers, Harry (left) and Eric better known as “Horace” (right), traded at the premises at 216 Barton Street from the turn of the twentieth century until the 1940s. They were the sons of Edwin Tovey, a Winchcombe Draper, who, after the death of his wife, moved to Gloucester with his sons. Pictured here, their shop windows display early advertisements for Potters Asthma Cure and Dr Thompsons Dandelion Coffee, as well as brands we recognise today, such as Ovaltine and Andrews Liver Salts. As their mural advertises, Tovey’s Drug Stores were the depot for the “Finest Drugs, Chemicals, Herbs, Herbal Remedies & Patent Medicines”. 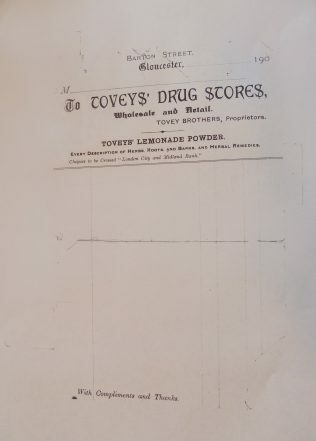 According to rumour, worried married ladies – and perhaps even worried unmarried ladies – were sure of a sympathetic ear from Mr. Tovey, while his more enlightened male customers could be sure of purchasing items which might keep the ladies free from such worries. 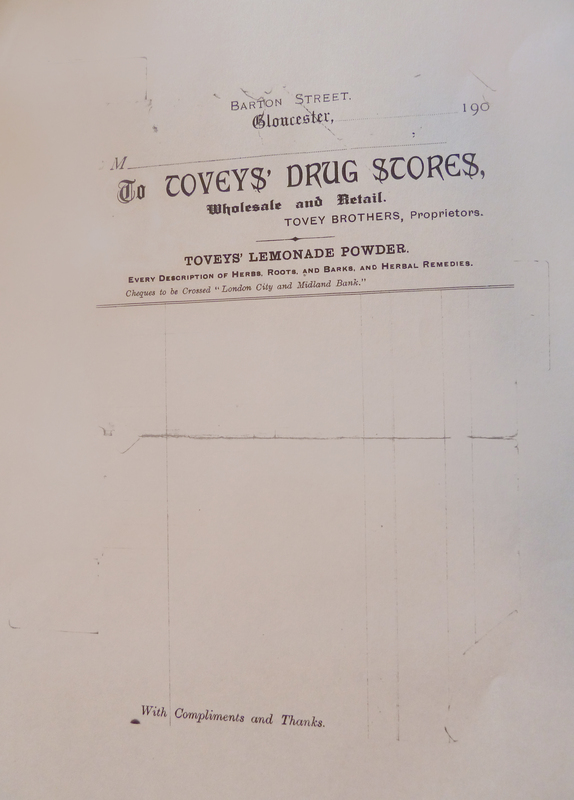 For 9 ½ pence per bottle customers could try Tovey’s “Pectoral Balsam” advertised as “The Great Lung Healer”. 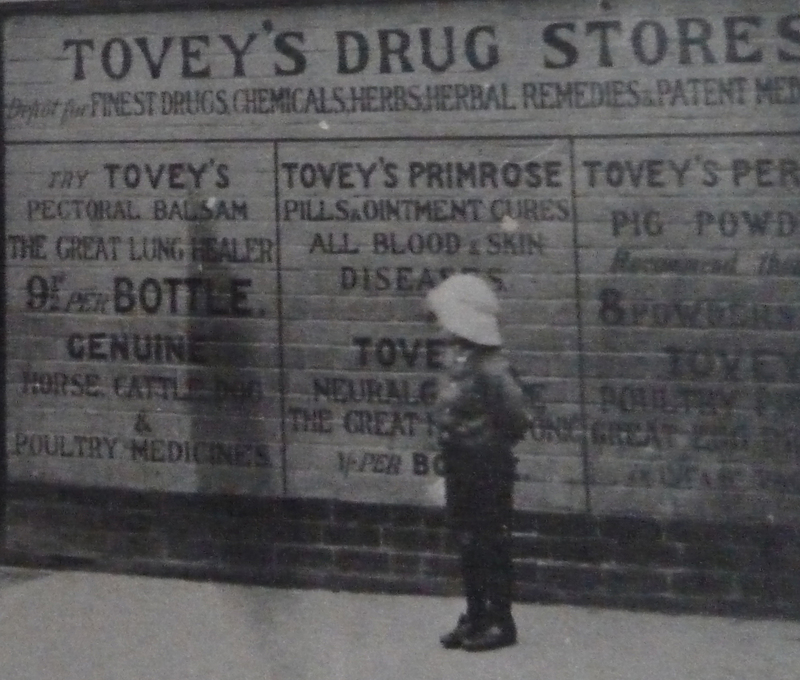 Or customers could buy Tovey’s “Primrose Pills & Ointments” which was said to cure “all blood & skin diseases”. By “strengthening the stomach” and “purifying the blood” Tovey’s Perfect Pig Powders kept pigs in a “Healthy, Highly-thriving condition”. 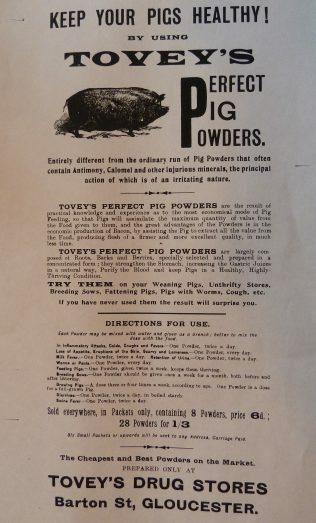 “Largely composed of Roots, Barks and Berries, specially selected and prepared in a concentrated form”, this advert reminded readers, they were “entirely different from the ordinary run of Pig Powders that often contain Antimony, Calomel and other injurous minerals”. Sold everywhere, 8 packets of Pig Powder could be bought for 6 pence.